Velma was in no way an ordinary child. Her young life was full of many different things. Velma was the oldest of four children her parents had. Her father, who was saved as an infant by the milk of a mustang mare while coming across the deserts in a covered wagon, worked as an operator of a freighting service using many horses and even some of mustang heritage. There is not much known about Velma’s mother, only that she cared for Velma as a child. As a child, Velma was troubled. She was disfigured from being in a cast in a San Francisco hospital when being treated for polio. But this didn’t stop her. As a matter of fact I believe it helped her, because this made her have great passion for animals that have been confined and suffering as she once did. Having a lot of time on her hands, Velma was constantly caring for animals on her parent’s ranch. She loved being on the ranch where she didn’t have to worry about being judged. She was in school but was harassed and made fun of by her peers only because of her disfigured body. But not everyone saw her that way. Velma’s childhood neighbor, Charlie Johnston, was a six foot tall part Delaware Indian that came to be her husband. He then took over her father’s ranch. Together, Velma and Charlie operated the ranch and made it into a ranch for children that had troubled problems, especially from being in the city. Velma also worked as a secretary for Reno insurance executive Gordon Harris. (Denver Public Library, Velma B. Johnston Special Collection). 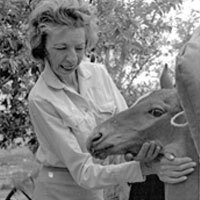 I think the spark that leads Velma into a life full of passion for caring for animals is when she was driving to work one day in 1950 and just so happened to come upon as tractor trailer full of wild horses. The trailer was stocked full of wild horses on their way to the pet food slaughterhouse. It was a horrible scene as she witnessed a yearling being trampled to death at the bottom of the trailer by its fellow horses. Just at that moment she realized that this had gone too far. Velma was going to try and help these poor creatures that were being lassoed and shipped across that country just to be slaughtered. (Harbury, Martin, 1944). Velma’s work began immediately. She began making public speeches and reaching out to her fellow horse lovers and ranchers. 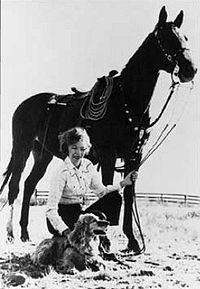 Her fight began in her hometown of Storey County, here in 1952, with a little help from her listeners; she was awarded the nickname, “Wild Horse Annie.” With her new name, Velma did wonders. She worked and fought hard enough that she got a bill banning aircraft and land vehicles from capturing wild horses on state lands. But sadly this was not enough protection. Pet food industries were getting around this law so Velma took it a step further. She worked with the people to get a public indignation and support for the first federal law to protect wild horses. 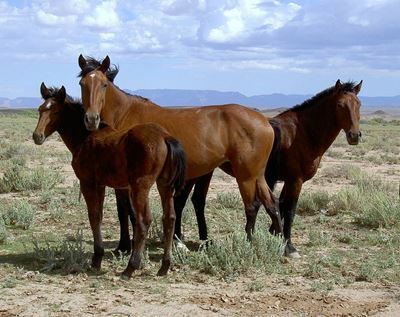 It was in 1959 with the support of Nevada’s U.S. Representative Walter S. Baring, that a law was made to prohibit the use of any form of motorized vehicles as well as the poisoning of water holes for capture or killing of the wild horses. In the middle of all this debate, Velma suffered a terrible loss. Her husband was suddenly struck with emphysema and passed away. Suffering at her loss, she still pressed on. Velma did presentations at schools and civic gatherings and also she sent out writing and illustrated fact sheets to the people that supported her. Just in doing this, she got many letters sent to Congress. And after testifying to Congress, Velma got her wish. The result of all her hard work was the Wild Free-Roaming Horse and Burro Act. This was passed and made a law in 1971 and gave the wild equines protection on BLM and forest lands. (Craig C. Downer). It's successes like this that make me like Velma. She fought her whole life to protect these wild creatures even though it meant getting threats on her life. On June 27, 1977, Velma passed away after bravely fighting a battle with cancer. So even till the end, she was a fighter and this is one of the main reasons I consider Velma my hero. She loved horses and took her own time to help save them. I believe that is a great thing to be proud of and look up to. I know I will always look up to her as my hero for doing what some people would consider impossible.